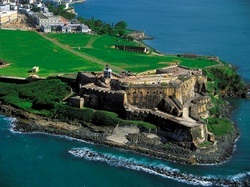 There are many things to do on you Puerto Rico vacation, but El Morro should definitely be one of them! Construction on El Morro began in 1539 and has basically continued for over 400 years. The Spanish maintained control over the fort from 1539-1898 and the United States controlled the castle from 1898-1961. From 1961 to present day El Morro has been under control of the National Park Service and used as a museum. Several movies and TV shows have used El Morro for scenes. Amistad, Wizards of Waverly Place, and Agents of Shield all of scenes featuring El Morro in Puerto Rico.